Building on the extremely successful and popular Russell’s Soil Conditions and Plant Growth, Wiley-Blackwell is pleased to publish this completely revised and updated edition of the soil science classic. 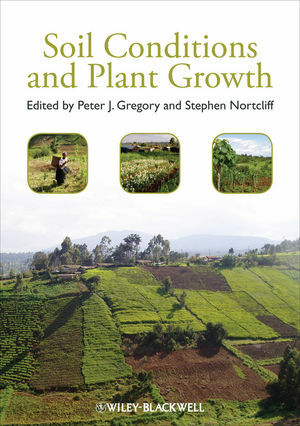 Covering all aspects of the interactions between plant and soil, Peter Gregory and Stephen Nortcliff, along with their team of internationally-known and respected authors, provide essential reading for all students and professionals studying and working in agriculture and soil science. Subject areas covered range from crop science and genetics; soil fertility and organic matter; nitrogen and phosphoros cycles and their management; properties and management of plant nutrients; water and the soil physical environment and its management; plants and change processes in soils; management of the soil/plant system; and new challenges including food, energy and water security in a changing environment. Providing a very timely account on how better to understand and manage the many interactions that occur between soils and plants, Soil Conditions and Plant Growth is sure to become the book of choice - as a recommended text for students and as an invaluable reference for those working or entering into the industry. An essential purchase for all universities and research establishments where agricultural, soil, and environmental sciences are studied and taught. Peter J. Gregory is Chief Executive of East Malling Research and a Professor at the Centre for Food Security, School of Agriculture, Policy & Development, University of Reading. He is also the author of the Wiley-Blackwell-published book, Plant Roots, and co-author of the second edition of Science and the Garden. Stephen Nortcliff is Emeritus Professor at the Soil Research Centre, Department of Geography and Environmental Science, University of Reading.